The EIM4-10T 10 Mbps miniature repeating hub provides a simple, cost-effective method for increasing a 10BASE-T system beyond two nodes or to increase network distances beyond the 100-meter limit of the 10BASE-T specification. The EIM4-10T is classified as a miniature, 4-port Ethernet repeating hub. Adhering to the IEEE 802.3 standard, the hub provides preamble regeneration with symmetry and amplitude compensation. A repeater must retime signals so that jitter, introduced by transceivers and cabling, does not build up over multiple segments. It must be able to detect either runt packets or collisions and reinforce detection by generating a Jam signal. As a final point, it needs to automatically partition jabbering ports so the entire network is not rendered useless. This unit supplies its transmitting ports with the necessary digital pre-emphasis to compensate for the inherent roll-off of signal strength on the twisted-pair cable. Each twisted-pair segment can be up to 100 m in length. Shielded RJ-45 connectors are used to accommodate either UTP or STP cabling. The Link Integrity function is supported — confirming that a functioning adapter or hub is on the other end of the segment. Hubs can be cascaded with either straight-through or crossover cables. Port 4 has an extra socket to allow switch cascading without a crossover cable. Each port LED glows when a valid link is made to other equipment — and flashes to indicate segment activity. One common green LED indicates power applied and a common red LED reports collisions on the shared Ethernet network. 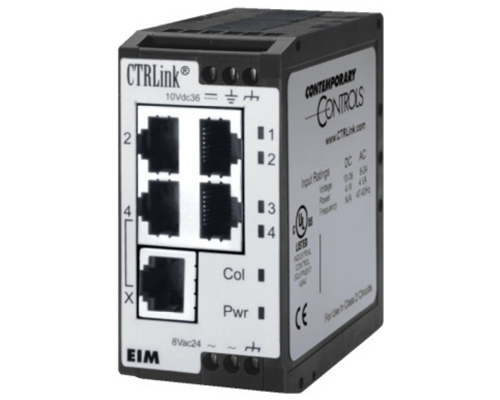 The EIM4-10T mounts on TS-32 or TS-35 DIN-rail, can operate from a wide range of low-voltage AC or DC power and offers redundant power connections. Please contact your regional office for ordering options.